Quantum mechanics reveals that just about the only certainties we have are that margins are permeable and that transformation is central to our lives and existence, in every instant and through time. In real life, momentary situations and ideas become crystallised into events, things, movements and eras, only to dissipate and reprise in favour of change. This paper seeks to explore elements of Steampunk origins [in the 1980s] and pinpoint aspects of an aesthetic and way of thinking that has spanned visual arts, fashion, performance and literature during the intervening decades. With particular reference to mutant vehicle art cars and machines such as Dung Beetle, Goodness Gracious and Stoomtrekker at AfrikaBurn 2018, this paper investigates whether an energising vector can be found in steampunkish transformation of some Victorian-era industrial revolution modalities. The big question here is whether some elements of Steampunk consciousness and creative characteristics, which emerged partly as a backlash against contemporary sameness of design and anonymity of products, among other factors, can be seen to be flourishing and finding new directions and means of expression at AfrikaBurn? This paper aims to open up possibilities for discussion and thus only loosely seeks to identify some potential correspondences and differences between Steampunk in the global north and performances by makers and machines like Dung Beetle, Stoomtrekker and Goodness Gracious locally. 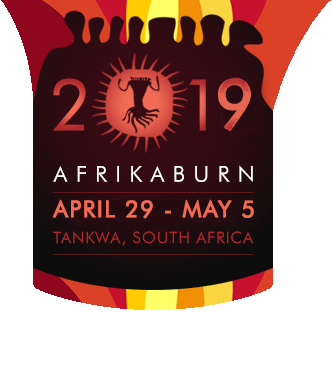 Idiosyncratic creative inventiveness prevails at AfrikaBurn 2018 with, for example, strong emphasis on repurposing junk shown by Pretorius and Dung Beetle, creation of a land-hugging steam-driven dirigible by Hicks, and on the relishing of absurdity by De Kock. It is clear at this stage that Steampunk offers some energising vectors and that there are both intentional and unintentional points of congruence, as well as healthy differences between elements of locally creative expressions of tinkering with machines, and those taking place elsewhere, including at Burning Man. One important difference has been articulated by Hicks (interview of 10 June 2018) who, for example, is dismissive of Steampunk as “just a look” that has not had much specific influence on his creative energies, nor on his way of thinking about making art. He explained emphatically in this interview that “I do not identify with Steampunk … my work is more than that … as a blacksmith I make whatever I feel like making, which has nothing to do with any particular style … the works I create are instinctive and integral to the materials I use … just as a poet assembles words to create meaning, so I have assembled pieces of found and created objects … like a mechanical haiku”. On the other hand De Kock (email of 1 July 2018) has noted that, for some, “an attraction of Steampunk is a desire to abstract and go back to a simpler view of the world. We want to see how things work in order to reassure ourselves that the invisible and unpredictable world is able to be perceived at least in terms of cogs, chains, cams and crankshafts … things we understand”. These are also inventive backlashes against sameness of design arising from mass production and profit-seeking in present times. Furthermore, blogger Eleen Polson has usefully identified an overarching AfrikaBurn rugged DIY trend that transcends Steampunkishness when she points out that here “tools, electronics and mechanics are utilised for the sole purposes of beauty and [or] entertainment [that] replaces the use of machines for economic or destructive war purposes”. Globally, similarities and differences in visual arts movements, such as Steampunk, foreground cyclically reinterpreted home-grown idiosyncratic ingenuity and manipulation of materials that chart own transitions and expressions true to individual local artistic visions and circumstances. Such cycles of worldwide creative performance and tinkering – mainly for leisure and fun – are occurring in similar ways to which fractals such as the Mandelbrot set are infinitely variable, while also containing changeable essences of what has come before. Steampunk is a growing movement and further transitions are inevitable, and there is sure to be more to it all than meets the eye. See the original conference powerpoint with extra visuals. Read the full version of the article on Research Gate. Yggdrasil the Tree of lIfe at AfrikaBurn 2017 in Tankwa Karoo.